Touch rugby. What is it? To resume, what is Touch Rugby ? Touch Rugby is a sport derived from rugby; it places emphasis on running, agility, and ball handling abilities which includes eye-hand coordination for passing and catching balls. It’s a “non contact sport”. 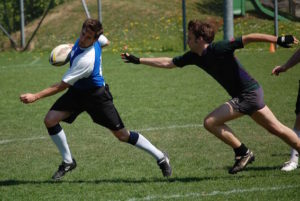 The basic difference between touch rugby and traditional rugby is the accepted defensive movement while the ball is in play. In rugby, players who defend are allowed to tackle the opponent. Doing that, a lot of things could go wrong during the tackle, and it can lead to serious injuries. In Touch Rugby, the movement and agility are the key facts : tackles are replaced by ‘touches’. Players only need to tag their opponents to indicate that they have been tackled/touched! Once a team has been touched” 6 times, the ball is lost and must be given to the other team. Then, they can launch an attack. After six touches, or if the attacking team drops the ball at any point, the ball is turned over to the other team.